As Women With Vision was closing we had a loose plan/idea to construct a virtual exhibition over the next few months – but hadn’t gotten into the design or nailed down an approach: what tools we’d build, what a virtual exhibition would look like at all. All I knew was the physical exhibition at the Muscarelle was about to close and if we planned to use the physical exhibition in the virtual exhibition, it needed to be captured before it disappeared. Toward the end of the show we talked about options and decided we would borrow a 360 video camera from the college and document the show with it. I stopped by the museum to experiment, took numerous videos and images of the space using the camera fumbled with connecting the camera to my aging laptop but once I’d managed to bring the footage into After Effects/Photoshop I was nervous about the image quality. The files just appeared to be too low res to work with – would not hold up. So, annoyed with technology in general, just before leaving, I stood in the galleries and quickly downloaded a few “360” apps onto my phone over W&M wifi, a solid connection. I didn’t really know what I was doing or if any of them would work but I walked through the galleries, spinning slowly, following directions and took numerous panoramas and 360 shots. What ended up on my phone were in fact equirectangular images which turned out to work just fine for most virtual tour software. The images could be sharper, colors more perfect, but for the first virtual exhibition I’m quite happy with how they turned out. Since working on this project I’ve begun to experiment with After Effects’ new tools for VR and to research cameras, test VR video file formats, and generally nerd out on current VR video/photography tech. 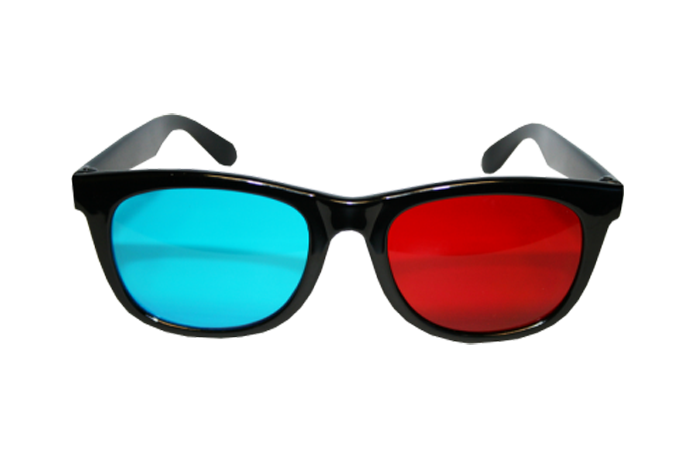 In college my friends and I ordered 100 Red/Blue 3D glasses from the internet, rented a movie theatre to project the 3D film we’d banged together in After Effects as our noise band performed in front of the screen. In the end we just didn’t know enough to create convincing 3D (or as some may have said: it wasn’t 3D at all). In the moment, on stage, the solution wasn’t technical, it was theatrical – as the audience came to chant along with us “It’s 3D enough”, and so it was.